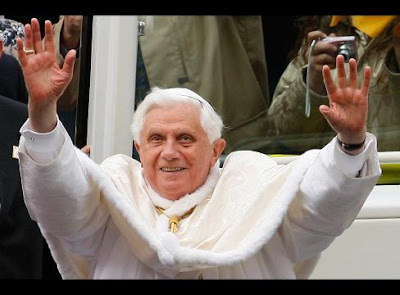 Unam Sanctam Catholicam: Ratzinger's 1985 "Prophecy"
Given the collapse of the markets over the past several months, it is no wonder that the press should have seized upon an article present by Cardinal Ratzinger in 1985 for the symposium in Rome, Church and Economy. However, the media is indulging in gross sensationalism by saying that Ratzinger had a "prophecy" that the capitalist markets would collapse (see here and here). If you read the article, Ratzinger quite rationally expounded the connection between the morality of a culture and their economic systems and said that as capitalism viewed itself as an amoral system, it had a fundamental error in its presuppositions, for morality cannot be divorced from economic activity. In fact, Ratzinger suggested that morality is essential for a healthy market: "the market rules function only when a moral consensus exists and sustains them." Towards the end of the paper, in the last paragraph as a matter of fact, he states quite plainly that failure to respect and take heed of this intimate connection between morality and economics can lead to abuses that will cause the system to "implode." First off, this is not anything close to a "prophecy." A prophecy, in the way the Church understands it, is a revelation from God about something to come. This is nothing like a prophecy. It's just a case of an intelligent thinker laying out, in cause and effect terms, what will happen to a market that refuses to acknowledge the moral dimension of man. I would say a more accurate term would be that the pope made a prediction or an educated guess, but not a prophecy. Why am I so caught up about the word "prophecy?" Well, a prophecy implies that the thing that has come to pass is something that no one could have predicted otherwise. If I say, I have a "prophecy" that the Detroit Lions will lose a football game, people will laugh at me and say, "That's no prophecy; that's just common sense!" But if I say something outlandish, like "I prophesy that on such-and-such a day, two centuries from now, a meteor will strike the earth in a specific place, and then in fact it does, then my prophecy seems more likely to belong to the supernatural realm for the very reason that the event came out of nowhere and was difficult, if not impossible, to predict without supernatural aid. Then by calling the Pope's prediction of the collapse of capitalist markets a "prophecy" the media is essentially saying, "God must have showed this fact to the Pope, because there's no way any of us could have foreseen that our system would ever collapse!" Do you see the subtlety? There is such an implicit faith in the soundness of our economic system, that nobody could imagine the ensuing collapse. And when one man does mention a possible collapse in a very scholarly, rational argument, are any of his points or reasons taken seriously? Does anybody look at the system and wonder whether or not the then-Cardinal Ratzinger may have understood something about economics? No -- it is simply written off as "he had a prophecy." Now, I know they aren't really asserting that this was a vision from God or something. Most of the media outlets simply have used the word in their headlines to grab people's attention, but still they have to understand that words have meanings and ideas associated with them, and that when we choose to say Pope Had a Prophecy of Market Collapse, when what we really mean is Pope Presented an Article on Weaknesses in the Capitalist System, then we are really being disingenuous. Even the voice is wrong: to say the Pope "had" a prophecy to say something in the passive voice about something that happened to the Pope, while the reality is that the Pope presented (active voice) a paper he wrote. It is simply a sneaky way to attempt to maintain the appearance of health to our financial system, so much so that anyone who foresaw its demise must have "had a prophecy," because no one else could have foretold it any other way! That's all I have time for right now, but I want to revisit this article in a few days, because it says some very interesting things about the connection between morality and economy, and it talks about some shortfalls of central economies and market economies.